Insurance for the Long Run. Regence BlueShield wanted to reach out to the top employers in the Puget Sound region, engaging them in conversation about switching their corporate health insurance plans. Focusing on health and innovation for over 100 years, Regence had a specific benefit over other insurance providers. 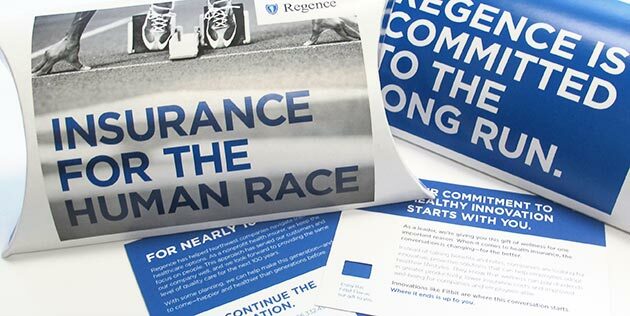 The goal of the project was to create a compelling direct mail piece that supported Regence’s commitment to innovation, wellness and the future. Arscentia helped Regence achieve their goal by creating a powerful, engaging package that was sent to decision-makers at the top 100 employers in the area. A Fitbit (a personal health-tracking tool) was creatively housed in each mailer, along with dynamic messaging and graphics that supported the theme of partnership, advancement and long-term wellness.